How to grab your audience's attention, and make a memorable impact. If the thought of public speaking gives you some serious jitters, you’re not alone. Those feelings of pressure and self-consciousness are common, but they’re also not permanent. The first step to becoming a better speaker is changing your attitude. Ditch the fixed belief that public speaking will always be a weakness of yours, and start welcoming the opportunity to improve through training. 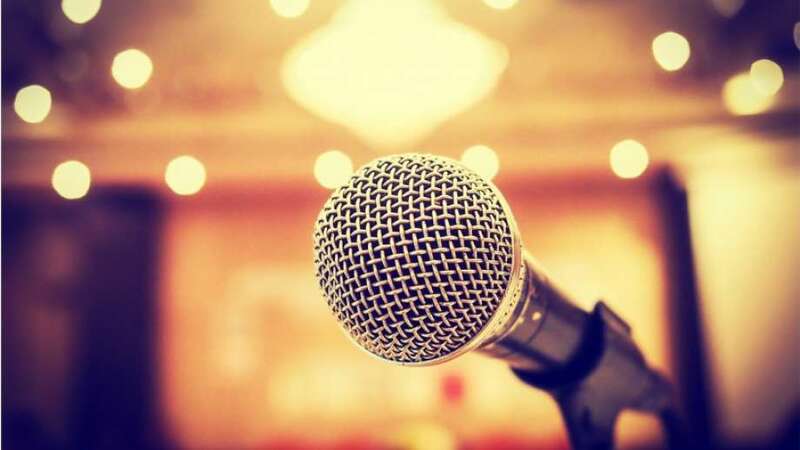 Along with holding importance throughout your full-time career, public speaking skills are especially crucial for the side hustlers and small business owners. Regardless of the setting, a meaningful presentation helps showcase your knowledge of a particular topic. This ultimately expands your recognition as an expert in your field. Here are 7 tips for delivering a speech that grabs your audience’s attention, and makes a memorable impact. Be clear on your outcome. Aiming for a flawless delivery? Focus your energy on the end result. DiResta suggests filling in the blank for the following statement: “At the end of the presentation, the audience will _______.” That answer is your desired outcome. So before overthinking your presentation’s structure or word choice, start prioritizing the aftermath. Recognize the impact you want to have on your audience, and the corresponding action. Your tactics and talking points will become a no-brainer. When you gain clarity of your outcome, everything else will fall into place. When it comes to delivering a successful speech, your setting can make all the difference. Certain communicators might excel at delivering speeches in front of a seated audience, but struggle with speaking via conference call or webinar. Once you gain experience delivering different types of speeches, you will begin to discover where you truly thrive. Rather than attempting to be everywhere at once, find that sweet spot and run with it. Although presentations are about speaking effectively, always make room for strategic silence. While you might be inclined to quickly fill any signs of silence during your presentation, start training yourself to become comfortable with these moments. Intermittent pauses can add dramatic emphasis to important points, and help maintain the audience’s attention. Much like how punctuation helps readers understand material, silence helps listeners grasp your message. Understand that mindset is as important as skillset. Improved speaking skills can be obtained with practice, but you’ll never progress with a negative mindset. “If you’re not empowered, you’re not going to empower your audience,” says DiResta. So instead of viewing presentations as an obligation, start honoring the opportunity to offer your unique knowledge and value. If you’re struggling to stay positive, DiResta suggests identifying the limited belief that’s getting in your way. Once you’ve recognized it, reverse it to create an empowering affirmation. Remember that it’s not about you – it’s about them. Presentation anxiety often has little to do with the speech itself, and everything to do with your viewers’ perception of it. Keep in mind that your audience is here to learn from you – not to judge your every move. Once you realize that it’s not about you, you can effectively prioritize the needs of your audience. To do this, ditch the introductory agenda and focus on becoming a listener-centered speaker. “A listener-centered speaker will start with a hook to draw the audience in, and lead them down the road to introducing the topic and a solution,” says DiResta. By addressing your audience’s specific needs, your presentation will offer more value. So stress less over opinions on your performance, and concentrate on helping your audience solve their problems and succeed. A fact-heavy presentation is an easy way to lose your audience, so don’t be afraid to get a little personal. Your listeners might trust that you’re credible, but they also seek an authentic connection. So tell your story. Your speech should offer an open and meaningful dialogue, as well as personal experiences and stories where appropriate. This reminds them that you’re not just a speaker – you’re also a friendly and reliable resource. Still sweating over public speaking? Take the pressure off by starting small, and working your way up with practice. DiResta suggests getting your feet wet by hosting webinars, or delivering a verbal update at an office meeting. You could also volunteer to host a Lunch & Learn for a small group of people, or co-host a client presentation with a colleague. These initiatives offer a non-intimidating way to gain comfort and confidence in your speaking abilities. Additionally, public speaking can become much less overwhelming when you break skills down one at a time. DiResta recommends identifying one speaking skill you admire (i.e. eye contact,) and practicing that for a month. When you reach a comfortable level, start working on the next skill. Diane DiResta, CSP, is Founder and CEO of DiResta Communications, Inc., a New York City consultancy serving business leaders who deliver high stakes presentations— whether one-to-one, in front of a crowd or from an electronic platform. DiResta is the author of Knockout Presentations: How to Deliver Your Message with Power, Punch, and Pizzazz, an Amazon.com category best-seller and has spoken on 4 continents. Diane is a Certified Speaking Professional, a designation held by less than 12% of speakers worldwide.